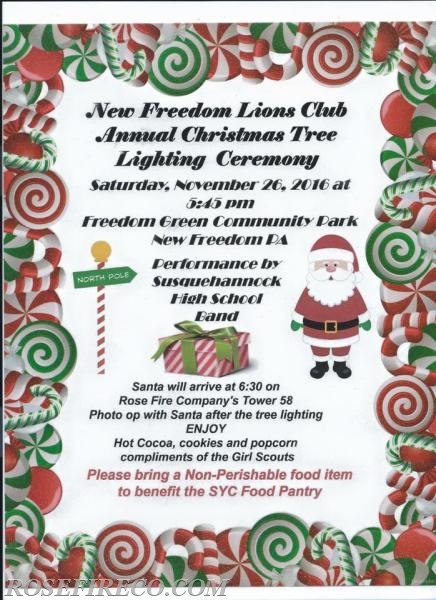 The New Freedoms Lions Club Annual Christmas Tree Lighting will be held on Saturday November 26th at 5:45 PM at the Freedom Green Community Park in New Freedom. Come watch as Santa who will arrive on Rose Fire Company's Tower 58 help light the towns Christmas Tree. Music Performance provided by the Susquehannock High School Marching Band. Photo Ops available with Santa after the Tree lighting and enjoy Hot Cocoa, Cookies and popcorn complements of the local Girl Scouts. Please bring a non-perishable food item to donate to benefit the SYC Food Pantry.